Top candidate of Peoples Party (OeVP) and Foreign Minister Sebastian Kurz talks with journalist after leaving a polling station in Vienna, Austria October 15, 2017. VIENNA - Young conservative star Sebastian Kurz is on track to become Austria’s next leader, projections of Sunday’s parliamentary election result showed, but his party is well short of a majority and could seek an alliance with the far right. While that would suggest he will turn to the anti-Islam FPO, he has also said there could be leadership changes within the losing parties, a possible hint at being willing to work with the Social Democrats if Chancellor Christian Kern were ousted as leader by Defense Minister Hans Peter Doskozil. The Social Democrats (SPO) have also opened the door to forming coalitions with the FPO, meaning the far-right party is placed to be kingmaker and play the two parties off each other during coalition talks. It is highly unlikely, however, that the Social Democrats would ally with the FPO if the SPO came third. 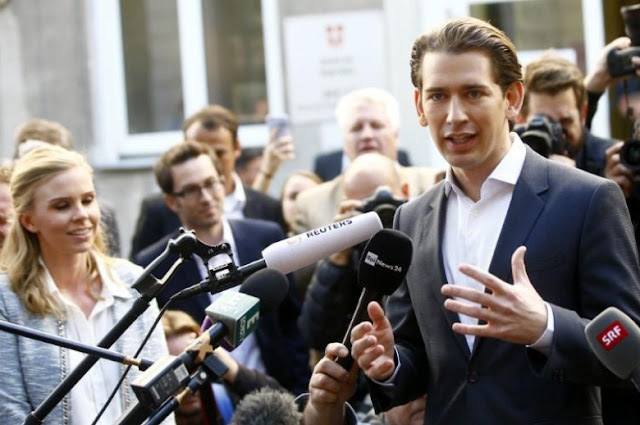 Young conservative star Sebastian Kurz is on track to become Austria’s next leader, projections of Sunday’s parliamentary election result showed, but his party is well short of a majority and could seek an alliance with the far right.